Get ready to see rocket ships, strange creatures, rocket men fighting robots, deadly machines�and Leonard Nimoy! 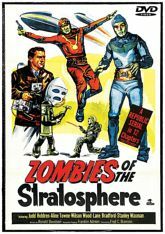 Zombies of the Stratosphere is perfect for viewers who lover the old serials -- those incredibly fun and silly episodic films that kept our parents and grandparents coming back to the theater week-after-week. Over the course of 12 episodes (plus the original theatrical trailer), you'll follow security agent Larry Martin (who can fly with an experimental rocket suit) and his cohort Bob Wilson try to save the earth from the evil Martians. Can Larry and Bob thwart the villainous Martian plan to blast our planet out of its orbit and replace it with their own? Why are some earthlings conspiring with their dastardly plot? There's not a zombie in sight...but you will find Leonard Nimoy, who got his start right here! Produced on a miniscule budget, Zombies of the Stratosphere still offered a weekly injection of action and adventure into the Saturday matinees! Relying on story and creativity, this serial still delivers a punch without earth-splitting explosions, computerized special effects, or tough-guy one-liners.